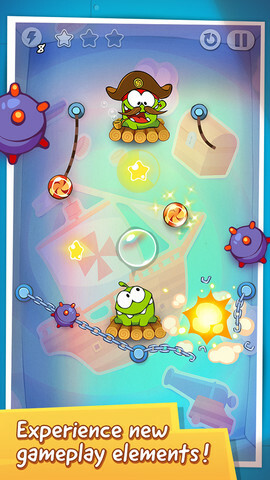 "Cut The Rope" and "Pudding Monsters": Episodes 11 & 12 of Om Nom Stories, and NEW Game "Cut The Rope: Time Travel"
ZeptoLab just posted the following 2 episodes of Om Nom Stories. Episode 11 was actually posted several days earlier by some game websites and named differently. I already displayed it in my previous article. Again, if you can't find the "hidden star" in any of the 2 videos above, you can look at the Answers page. I've placed these and other interesting puzzles in the Puzzles page (14 puzzles now, 12 video puzzles and 2 old picture puzzles). 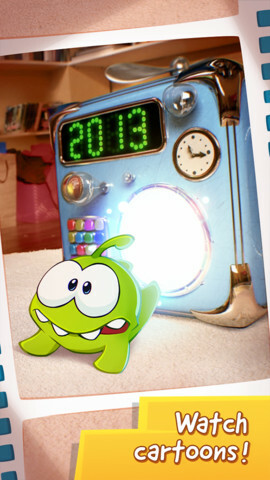 Join Om Nom as he travels back in time to feed his ancestors with candy. 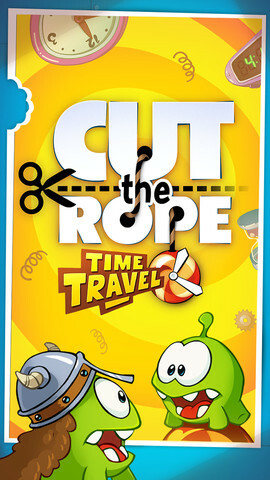 "Cut The Rope: Time Travel" is a completely new adventure filled with time-travelling, candy-crunching, physics-based action ! I got the "Feeding Time" achievement easily as I was replaying the levels and I think you should play more often in the 2nd box "The Renaissance" where the "Freeze Time" button was introduced in Level 2-01. You're mistaken actually and they're not referring to the "Flying Candy" introduced in the 4th box. You can get this achievement easily in Level 2-02 and others. 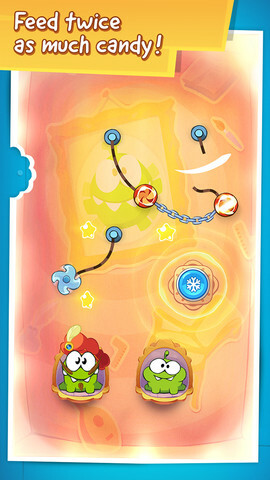 In Level 2-02, you only have to concentrate on feeding candy to Om Nom (the upper one) and not his ancestor. Cut the 2 upper ropes to send the candy quickly to Om Nom's mouth and then "freeze" the time when the candy just reaches Om Nom's mouth. (1) Cut upper left rope 1st and "freeze" the time when the candy is directly above Om Nom. (2) Cut the upper right rope. 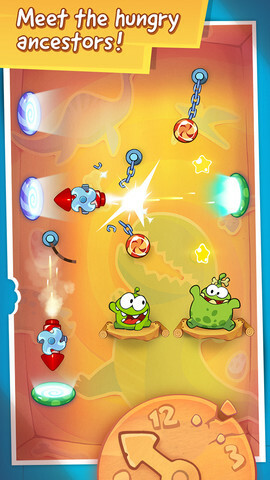 (3) "Unfreeze" the time and "freeze" it again when the candy just reaches Om Nom's mouth. "Interrupted dialogue" - Feed the candy to Om Nom while he is talking to a friend. At the start, you have to wait a short while for Om Nom's ancestor to talk 1st then send the candy to Om Nom in order to get this achievement. Because Om Nom will only start talking after his ancestor has spoken. If you miss the timing, tap on the "pause menu" button and reselect the level. If you just "restart" the level, Om Nom won't talk immediately. If you wait long enough, the 2 Om Noms will talk again once in a while but it's harder to get the timing right. If you select Level 1-01, a video clip (shorter version of Episode 11 in "Om Nom Stories") will be shown. To skip this short animation, just tap anywhere on the screen. For the "Vertigo" achievement (Quickly turn Om Nom's platform 360 degrees), you can get it easily in Level 5-01. Press BOTH air cushions at the same time so that both the candies touch the "switch" and Om Nom's platform would turn 360 degrees. If only 1 candy touches the "switch", the platform would only turn 180 degrees.